Every year before going on vacation I dream of white sandy beaches, watery cocktails and cheap whodunits in paperbacks. Spending all day lounging in the sun doing nothing seems so heavenly! Then, while on the beach of my dreams, I inevitably catch myself planning to drive to a couple more places “since we’re already here.” Hawai‘i – the favorite vacation place for so many – surely has the best sandy beaches in the world, and is extremely conducive to lounging in the sun, but it would be unwise to skip other amazing things to see and do, especially if “we’re already here.” This year, traveling to Maui my husband and I had a goal to study the island more or less in depth. Instead of staying in one place and doing daily radial routes we booked different hotels in all four directions of the map. This tactic proved successful by bringing in some interesting discoveries, and also by creating an impression of a longer vacation. 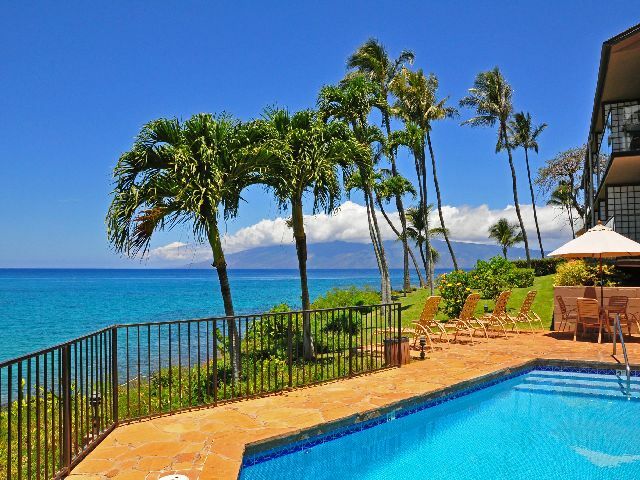 Our first room with a view was reserved at The Fairmont Kea Lani in South Maui. Designed by a Spanish architect, the white-walled hotel adorned with domes and towers, resembles the iconic “Pink Palace” – Royal Hawaiian in Waikiki. The “white palace” is surrounded by serene green lawns, palms, and blue pools. 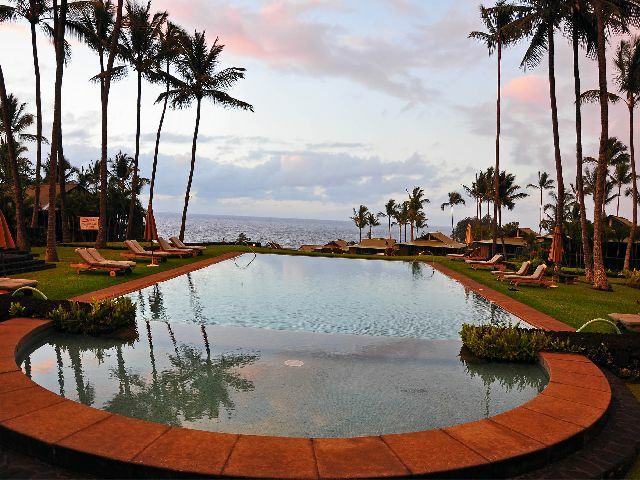 KoRestaurant, voted the Number One resort restaurant on Maui, puts a lot of emphasis on “plantation inspired cuisine” with its Spanish, Portuguese, Filipino, Japanese, Chinese, and Korean origins. Ko cocktails are made with fresh fruit juices and complement Ko specialties, like seafood Laulau steamed in ti leaves. Not far from the hotel there is a little known rocky beach at La Perouse Bay. Jewel-colored tropical fish is obviously prospering here, undisturbed by crowds of tourists. A modest monument in the shape of a truncated pyramid is dedicated to La Perouse, the famous French explorer and the first European who landed at Maui in 1735. 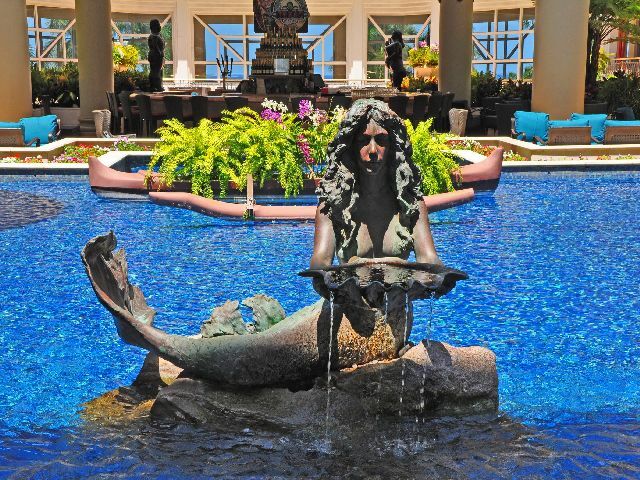 Our next point of interest was the Grand Wailea Resort, known for its 300-pieces strong Waldorf-Astoria collection of art –from wide-hipped bronze Venuses of Fernando Botero to delicate colorful glass sculptures of Dale Chihuli and translucent wooden bowls of the Hawaiian artist Jim Meekhof. We dined at the hotel’s restaurant named after the official state fish of Hawai‘i Humuhumunukunukuapua’a and famous for its fresh seafood preparations. My multi-layered dessert of Kona coffee ice cream and macadamia nuts was decorated with a chocolate figurine of a fisherman with a spear, inspired by a statue outside the restaurant. Next morning we headed up north, to Napili Kai Beach Resort. A front desk receptionist greeted us with “Welcome home!” This family-friendly place is appreciated by repeat visitors for its gorgeous beachfront location and relaxed ambiance. 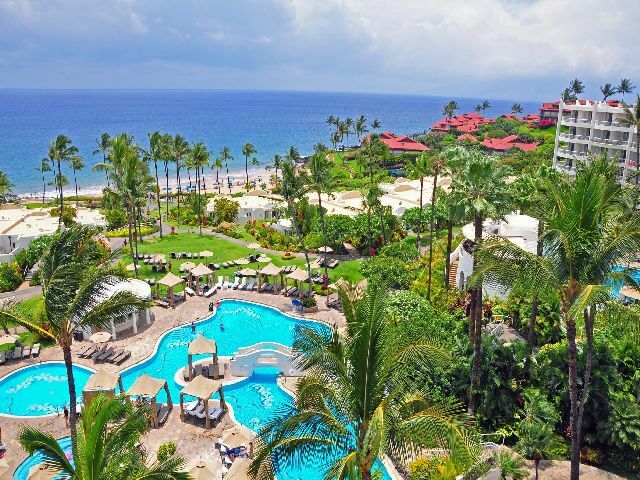 The room rate includes many pleasantries, like beach chairs and umbrellas, barbecue facilities, and daily educational and entertainment activities, among them Napili Kai Foundation keiki hula show andSlack Key Show hosted by the local celebrity George Kahumoku Jr. Families come here with their elders and newborn and make fast friends with each other and resident cats. The Sea House, a resort restaurant, changes its offerings often for the sake of frequent diners. Right outside the resort there is Merriman’s restaurant– one of the leading establishments for Hawai‘i Regional Cuisine. Executive chef Neil Murphy makes abundant use of Hawaiian lobster, kalua pig, locally grown avocados and tomatoes, Maui sweet onions, Big Island goat cheese and mushrooms, Kula strawberries, and other Hawaiian specialties. Our further exploration took us to Ka’anapali Beach in West Maui, which happens to be my favorite beach in the world. The sand seems softer and cleaner here than anywhere else, the water for some reason is warmer and calmer, and the sunsets are unobstructed and more dramatic than elsewhere. 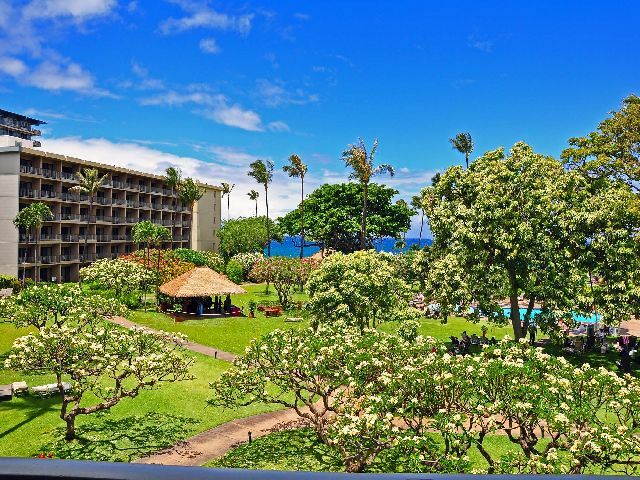 Ka’anapali Beach Hotel, opened 50 years ago, occupies an oceanfront building behind blossoming plumeria trees and a whale-shaped swimming pool. This “Hawai‘i’s Most Hawaiian Hotel” takes pride in its cultural programs offered free to its guests. True to my habit, I studied a long list of offered activities, and lei making, hula and ukulele lessons, and Hawai’ian language introduction sounded very tempting, but the moment I crossed the velvet sand and stepped into the tender waves of Ka’anapali Beach, everything else seized to exist. I spent many hours chasing fish and watching sunset from the water, trying to outlast all other swimmers. The only activity I agreed to take part in was the famous award-winning champagne brunch at the hotel’s Tiki Terrace Restaurant. An open-air dining room was festively decorated and filled with the hotel guests and local families. A Hawaiian band was playing on a small stage, and graceful hula dancers were performing their silky moves. The buffet was overflowing with island delicacies. Soon we headed to the eastern shore of Maui via Hana Highway with its 600 curves and 54 one-lane bridges. I made a list of en-route sites well aware that it would be easy to miss them on the winding road. The most accurate directions sounded like “between mile markers 6 and 7” or “1/2 mile past marker 16 on the left.” We couldn’t have missed Painted Bark Eucalyptus trees with their rainbow-colored trunks, and were stopping more often than intended to look closer at the lush greenery of the rainforest, shimmering bamboo groves, scarlet flowers, black lava rocks and turquoise lagoons. The beauty of the road was only comparable to that of our destination whose very name sounded like music – Travaasa Hana. Located on a picturesque cliff over the Pacific this secluded resort is so huge, that the hotel staff drives guests around in golf cards. Tired from sitting in our car, we were happy to go on foot especially that on every step there were stunning views of the ocean, exotic blooms, mirror pools, or cozy cottages to be admired. After a skillful massage at The Spa at Travaasa Hana I stepped into an open air lava rock hot tub. Palm trees were gently swaying overhead, the breeze was soft and warm, and the clouds just started to acquire a rosy evening hue. Behind a green lawn the endless blue of the ocean merged with the sky. Seated at the terrace of Ka’uiki Restaurant for dinner we noticed that all other patrons were in couples and all of them without exception were holding hands, hardly noticing what they were eating. We were in the land of honeymooners! Although our own anniversary was not imminent, falling under the spell of this place we were also holding hands – up until our cocktails arrived. I did notice what we were eating, because all the dishes were not only very well prepared and made with fresh local ingredients, but were also listed on the menu with their calorie count, and the count was not scary! I should’ve gone without dessert anyway, but the next day we had planned a rugged coastal hike, a swim in the ocean, and then a long trip to the airport and back home. Our wonderful Maui vacation with all its indulgencies was coming to its end.